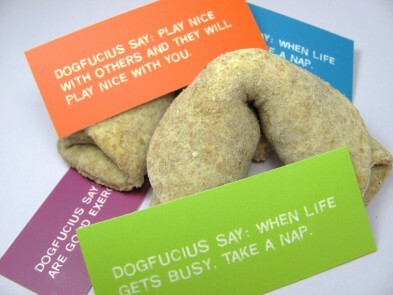 I ordered a nifty set of Moo mini-cards to look and read like the ‘Confucius Say’ joke fortunes (I’ve even got lucky numbers on the back) so I had to make some doggy fortune cookies to hand out with them. Maybe one day you’ll meet me on the street, covered in flour and dog drool, and I’ll shove a cookie in your hand and beg you to visit my site! In a large bowl combine all ingredients, making sure to mix well after each addition. 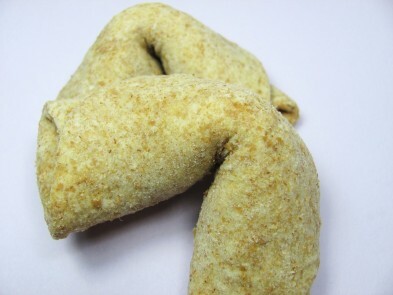 Once well combined Roll out dough as thin as possible then cut with a circle cookie cutter. Roll the circles into tubes and fold in half to form fortune cookie shape. 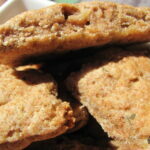 Place cookies on ungreased cookie sheet and bake for 10 minutes until the edge brown. Makes 1 to 2 dozen cookies. 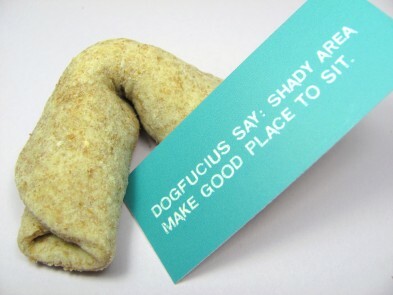 These are so cute…and love the idea of fortune cookies for dogs! This is fabulous I think this will be my next adventure this weekend. when do you add the fortune? Great recipe. My dog likes them. But, he really loves the taste of almonds. Loves the fortune cookies you get from take out. 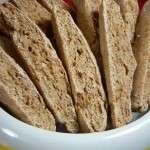 I’ve found a recipe for biscuits using almond butter. He likes it, but runs hot and cold with them. 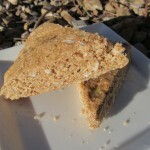 I was baking for the holidays today using almond paste. He loved the smell of the paste. I’d like to use it in a recipe to make treats for him, but I cant find anything on the internet to confirm whether it is safe. 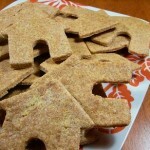 Do you know if almond paste is safe for dogs? I’m not really familiar with almond paste but when I looked it up it seems like it contains a lot of sugar and corn syrup which is good to keep away from dogs but according to the ASPCA (who I go to for all my food questions!) almonds themselves are okay for doggies. “The good news is that there is currently no data indicating that almonds (Prunus dulcis) are toxic to animals. So the sugar in almond paste looks like a reason to keep it away from you pups. Woof!